Seven-year-old Andrew Burke with Sandy, presented to him by his hurling hero Brendan Bugler at Whitegate on Saturday. SEVEN-year-old Andrew Burke from Whitegate has had his wishes come true, as he received a number of special surprises on Saturday. 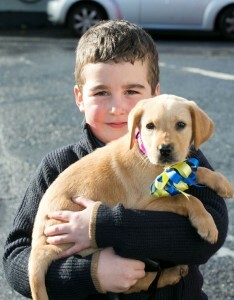 The Make a Wish Foundation arranged for Andrew’s wish of owning a puppy to come true. Andrew suffers from neuphratic syndrome, a condition affecting the function of his kidneys. Andrew was put forward for the wish by his play specialist in Temple Street Children’s Hospital, Olive Kenny. 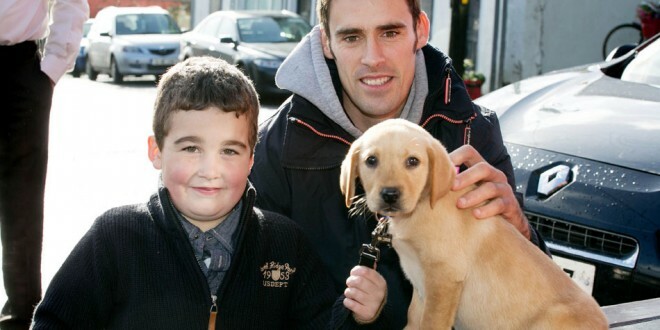 As part of this, Andrew had to fill out a wish book, which asked him things such as if he could be anyone in the world, who would he be or if he could meet anyone in the world, who would he meet, as well as other things such as his favourite restaurant, which he said is the Half Barrel in Whitegate. He filled out every bit of it himself and when it came to choosing his number one wish, he said he wanted a puppy. Mum, Leanne, explained what happened on Saturday when Andrew’s wish became a reality and the Burkes welcomed the newest member of the family, Sandy the golden Labrador. “It was amazing. Andrew hadn’t a clue what was happening. All he knew was that he was getting the puppy on Saturday and he thought someone was going to come to the door and hand him the puppy and that was it. I knew everything and he was up and dressed at 6.50am on Saturday morning. 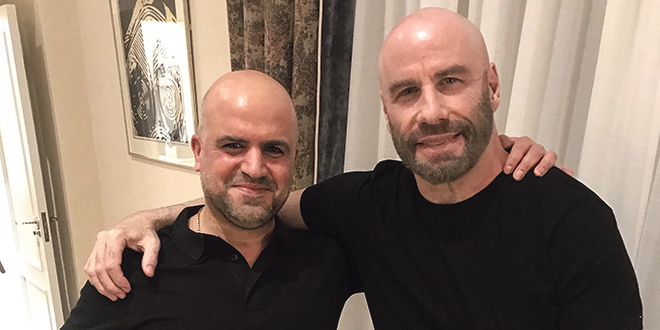 “He was inside in the kitchen at 10.30am when I saw this big limo arrive up and I called him and I said, ‘Andrew, your first surprise is here’. He came running out to the hall. He got such a shock, his face was so funny,” Leanne said. His mum, dad, Andrew and his little sister, Gemma, got into the limo for their mystery trip and all the while, Andrew was wondering when he would meet his new puppy. “The four of us went with him into Ennis, where we went to a pet shop. He went in thinking still he was going to get his dog there but he was there to get all his stuff for the dog; her food, bowls, toys, collars and leads. The owner of the shop gave him two dog encyclopaedias and a cup with the picture of his dog on it,” Leanne said. It was then back to the limo and onwards to the Half Barrel in Whitegate, where it was arranged for him to have his lunch. Leanne said Andrew was itching to get home in case his puppy would arrive while he was out but with some coaxing, he was delighted to have stayed. “The next thing, Brendan Bugler arrived in the back door and we said ‘Andrew, look who is coming?’ He didn’t even see the puppy in Brendan’s arms because he loves Brendan. He loves hurling and plays for the Whitegate U-8s. Brendan walked over slowly to him and he still didn’t see the puppy for a couple of minutes. Brendan bent down to give him the puppy and then he just looked and his face and his eyes just shone and he said ‘is that my puppy’ and everybody clapped. He was delighted,” Leanne outlined. Gemma also got a wish granted, as when she heard of her brother’s wish, she said she would like to wish for wings. Leanne organised to get her wings, as well as a certificate making her an honorary fairy. “Batt O’Riordan of the Half Barrel presented her with her wings and that made it special for her as well,” Leanne added. Neuphratic syndrome, which Andrew suffers from, means his kidneys don’t function properly. The syndrome leads to a high level of protein passing from the blood to urine and this can cause swelling. He is on daily medication and requires regular trips to Temple Street for intensive treatment. In light of this, Andrew has even prepared for Sandy to be looked after when he needs to go to Dublin for treatment. “He never complains and he misses out on so much. He brings Sandy for walks first thing in the morning and has even organised for his best friend to come over and mind her if he is in hospital,” Leanne said. Sandy has settled in and is already like a new member of the family. “Andrew waited for his daddy and myself to be asleep the other night and snuck down at 1.30am, so he could sneak her upstairs to bed with him. It was such a magical day for him,” she said. Make-A-Wish® Ireland grant the wishes of children aged between three and 17 years living with life-threatening medical conditions to “enrich the human experience with hope, strength and joy”. It receives no government funding and relies on the kindness of people and local communities to succeed in its aims. To donate or find out more, visit their website.